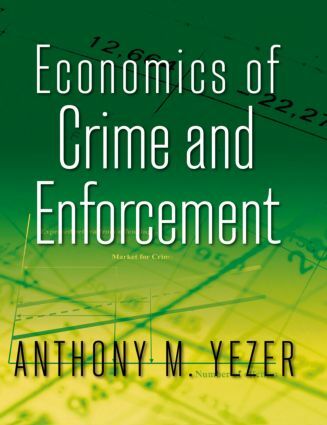 This text is designed for use in a course on the economics of crime in a variety of settings. Assuming only a previous course in basic microeconomics, this innovative book is strongly linked to the new theoretical and empirical journal literature. Showing the power of microeconomics in action, Yezer covers a wide array of topics. There are chapters on the following topics: benefit-cost and the imprisonment decision, enforcement games, juvenile crime, private enforcement, economics of 3 strikes law, broken windows strategies, police profiling, and crime in developing countries. There are also separate chapters on guns, drugs, and capital punishment. Timely boxed examples are found throughout. Problems at the end of each chapter allow students to reinforce their microeconomics skills and to gain insight into the way they can be applied to case examples. Anthony Yezer is Professor of Economics at George Washington University where he directs the Center for Economic Research.